Tinsel Trout, Harvest Trout, Yellowbellies, Sea Runs, Cutts, these are just some of the names which anglers call the coastal sea-run cutthroat trout. The first two names are associated with the time that these spunky sports trout enter their various home rivers to feed on salmon fry in the spring or, salmon eggs in the fall. The latter names are those affectionately used by B.C. anglers who have had a long association with this special trout. One of the greatest concentrations of these most desired sports fish is in the very accessible Oyster River on the east coast of Vancouver Island. Every year hundreds of anglers, fly fishers, spin fishermen, and bait fishers hike the lower miles of the river in search of these exciting trout. Thanks to the efforts of the provincial Fisheries Branch their search is rarely in vain for during the past decade the Fisheries Branch has provided a major hatchery stocking program in the Oyster river using brood stock taken from that river. Last autumn I watched Vancouver Island Fisheries staff, under the direction of Rick Axford of Region 1 Fisheries management, net the river in their annual search for brood stock adults. It was an impressive sight. Earlier in the day, in teams of two, Fisheries officials swam the river using snorkels to count the numbers of fish in the river. While swimming they were able to locate the greatest concentrations of fish in the river for purposes of netting. When I arrived at the river they had made their pool selection estimating that a few hundred sea-run cutts rested in one particular pool. With the help of angler volunteers, I watched and photographed as they pulled a net across the head of the pool and then dragged it down through the pool. 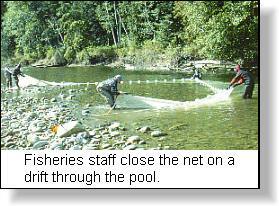 To keep the fish from escaping downstream, members splashed the water in the shallows at the tailout chasing them back into the net. 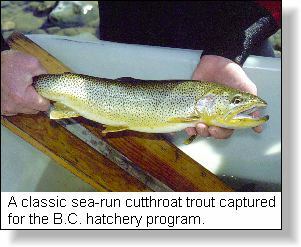 According to Ray Billings, Manager, Vancouver Island Trout Hatchery, Fish Culture Section, Ministry of Environment, Lands & Parks, who was assisting with the brood capture, what they required were 15 adult pairs for hatchery purposes. On the first drift through the pool about six pair were captured in the net. These were subsequently netted by small hand nets and placed in special holding buckets for later examination. Later, those selected would be transferred to the Ministry of Environment fish tank truck for transporting to the Duncan hatchery. A second swing through the pool netted even more sea-run cutts along with pink salmon, coho adults, jacks and numerous salmon fry species, and, a fresh run bright adult hatchery steelhead easily identified by it's clipped adipose fin. All these species came from the one single pool, a sign of just how productive is the Oyster river. On the third drift they completed the take necessary for the numbers of sea-run cutthroat trout needed but, this time, they also netted an adult Atlantic salmon. This latter fish has been taken to the biological station at Nanaimo for study. It seems that Atlantic salmon are now being caught in many mid and north Island river systems. These are fish that have escaped from commercial net pens situated in B.C. fjords. During one break in the netting I talked with Ray Billings and asked him what would be the next stage for these captured brood fish. He told me that they would be transported to the old provincial hatchery site at Duncan where they would be held and fed for the next three months. Fisheries will then spawn these adults, usually between January and February, until they have the needed 12,000 eggs which will result in approximately 10,000 smolts. The adult fish are left at the old hatchery for the entire time until they are returned and released back to the Oyster river. Fisheries will transfer disinfected eggs from the old hatchery to the new hatchery. Here they are to be incubated in isolation and the eggs will hatch in late March/early April. The fry will be raised in this new hatchery to be released one year later in the Oyster river. Ray told me that virus sampling is done as a precaution and that, "This new hatchery has never encountered a virus but, we are always checking." 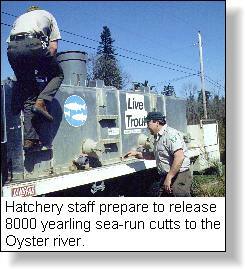 The following spring I received an email message from Ray saying that they were going to release 8000 sea-run cutthroat trout in the lower Oyster river the next day. These were the progeny of the autumn catch and I was most interested to see how this brood stock had fared. Two large hatchery trucks met me on Glenmore road and we drove to the release pool. Using a long flexible pipe attached to the tanks on the back of the trucks hatchery staff sought a safe section at the edge of the pool and began to pump the cutts into the river. In a few minutes it was done and the river was dotted with pastel green fish adjusting and acclimatizing to their home river. These were very healthy fish and I commend fisheries staff for the care with which they handled these beautiful 5 to 8 inch trout during the stocking. 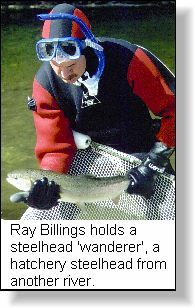 Ray was very enthusiastic about the Oyster river sea-run cutthroat trout program indicating that it had a high priority in Vancouver Island sports fisheries management. "It is a popular fishery," he said "with the primary goal being to provide an easily accessible hatchery and wild mix of sea-run cutthroat trout for Island anglers". As one angler who has fished my cherished Oyster river for many years, I heartily endorse the work and efforts of Fisheries on my glorious home stream.